I recently got an Amazon Kindle Paperwhite. Did you know you could do all these things with a Kindle? This entry was posted in books on April 30, 2015 by kellykoepke. A laugh for your Wednesday. 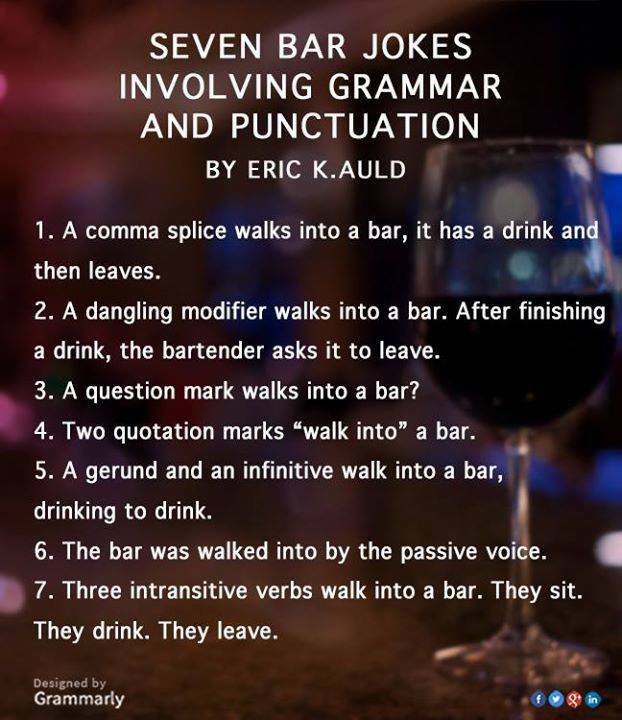 Bar jokes! This entry was posted in Grammar on April 29, 2015 by kellykoepke. This entry was posted in Uncategorized on April 28, 2015 by kellykoepke. Who better to tell your story than you? You could do it yourself, but something’s stopping you. I can help. Youll get that website, blog post, newsletter or article written faster than you thought because I’m beside you the entire time - in person or virtually. This entry was posted in Ghost Writing on April 27, 2015 by kellykoepke. Friday tip: Know your style. Do you want the message to be presented in a humorous way? Formally? With a cheeky tone or in a straightforward manner? This entry was posted in Friday tip on April 24, 2015 by kellykoepke. This entry was posted in Grammar on April 23, 2015 by kellykoepke. From the Philadelphia Museum of Art​. Reading! This entry was posted in Grammar on April 22, 2015 by kellykoepke. This entry was posted in Social Media Marketing, Web Copy on April 21, 2015 by kellykoepke. Need help putting your marketing materials together? I’m available to guide you as you create websites, newsletters and press releases. I can be beside you the entire time – in person or virtually. Find out more by contacting me. This entry was posted in Blog, books, Brochures, Ghost Writing, Grammar, Newsletters, Press Releases, Social Media Marketing, Web Copy on April 20, 2015 by kellykoepke. Friday tip: Know the vehicle by which your message will be delivered. Is this message for an email campaign, a web site, an article in a business publication, or something else? The method of information presentation will often dictate the content and message length. This entry was posted in Friday tip on April 17, 2015 by kellykoepke.